Growing up I knew of only one kind of cheesecake. It was a delicious cheesecake that my paternal grandmother would make us that had a graham cracker crust on the bottom, sides and top; pretty unique I thought. 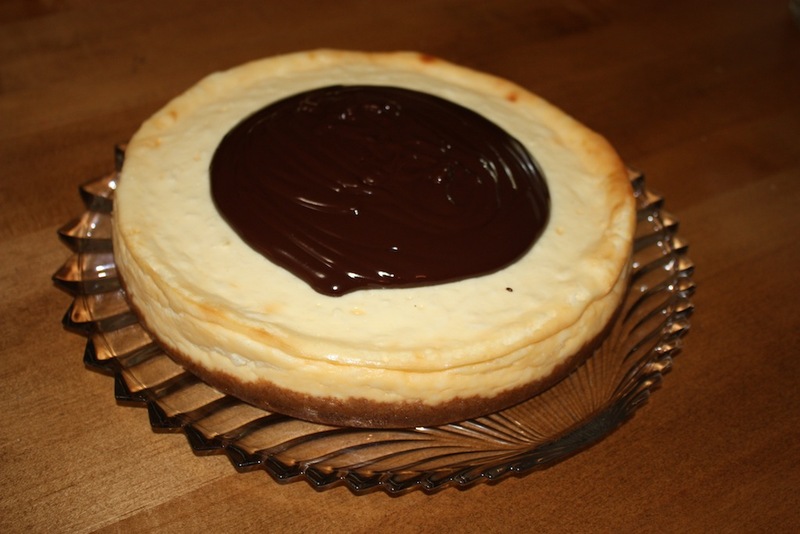 As an adult, I realized that there are all kinds and styles of cheesecakes. Some are light and creamy, yet others could break your foot if a slice dropped on it. Some are filled, while others are plain. Some get topped and others are left naked. Being the very inquisitive person that I am when it comes to desserts, I have tried more cheesecakes than I can count. 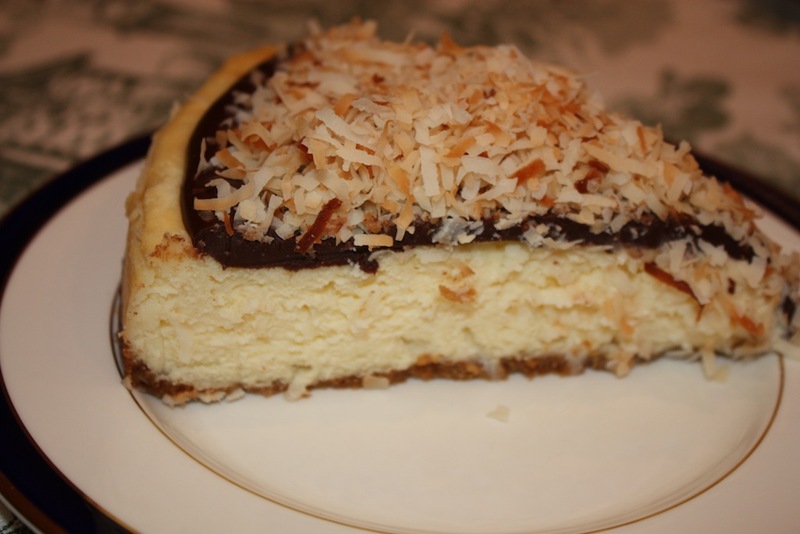 One experiment’s result that I love is this Coconut Cheesecake. I have a weakness for contrasting consistencies within a dessert. 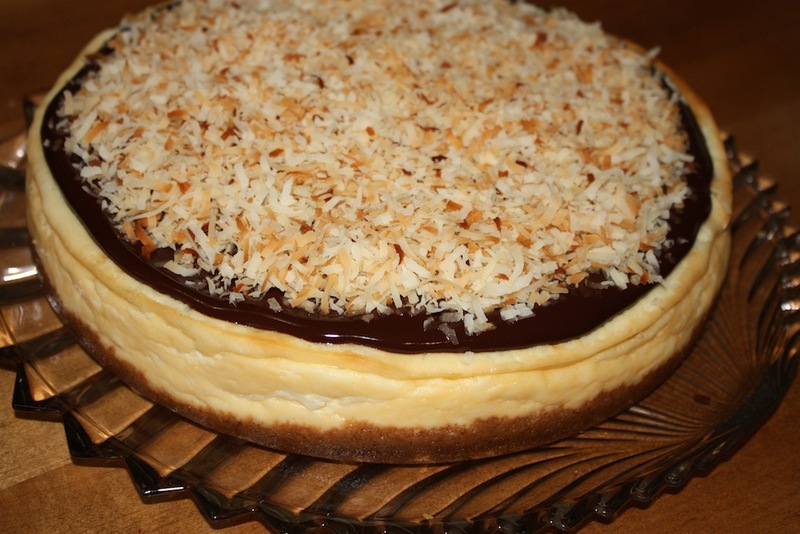 In this case, there is a smooth coconut graham cracker crust covered with a creamy cheesecake made a tad more ‘bumpy’ due to all of the coconut flakes within, which is then covered with a smooth decadent chocolate layer that is finished off with crunchy toasted coconut. I think only the kitchen sink is missing. The cheesecake must be made ahead, which makes this dessert perfect for entertaining as you will not need to do anything last minute. 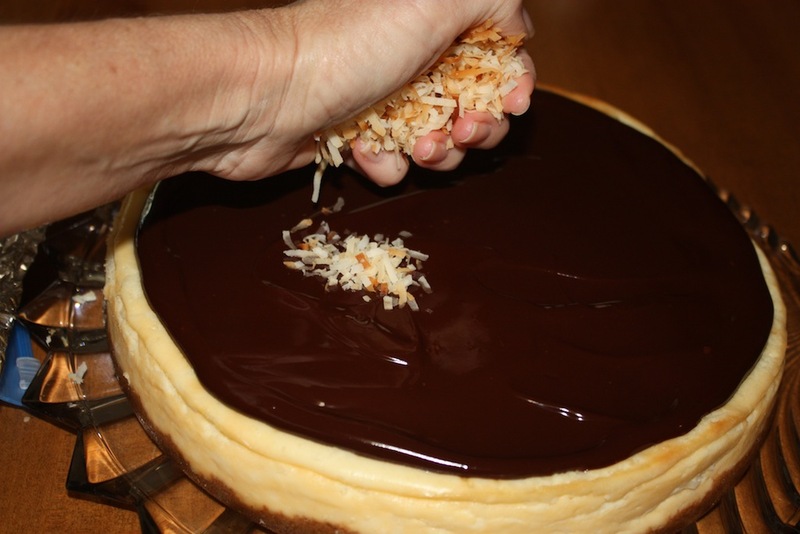 The chocolate topping and toasted coconut may be added anytime during the day that you will be serving Coconut Cheesecake, continuing with that easy entertaining mode that I love. After all, baking should be about making something delicious that you want in a timeline that allows you to enjoy the process as well as the results. At least that has always worked for me. 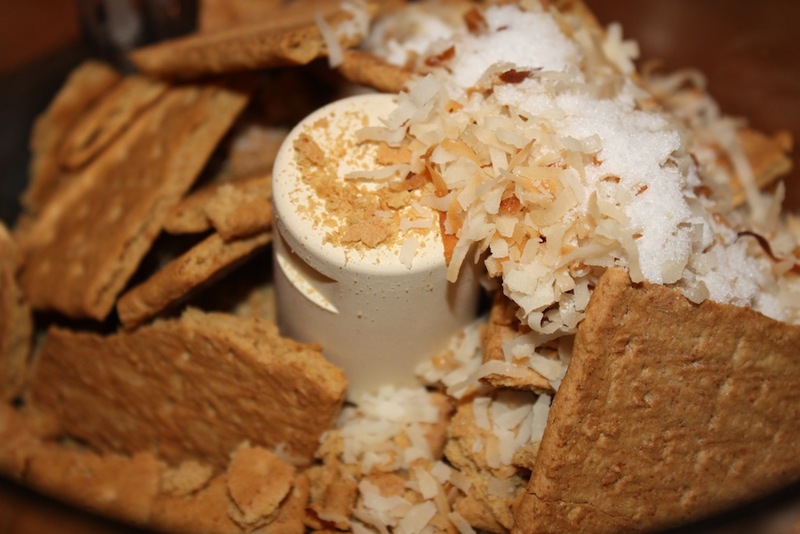 Place graham crackers, toasted coconut and sugar in a food processor. Pulse on and off until you have a fine powder. Add the melted butter and pulse until combined. Set aside. 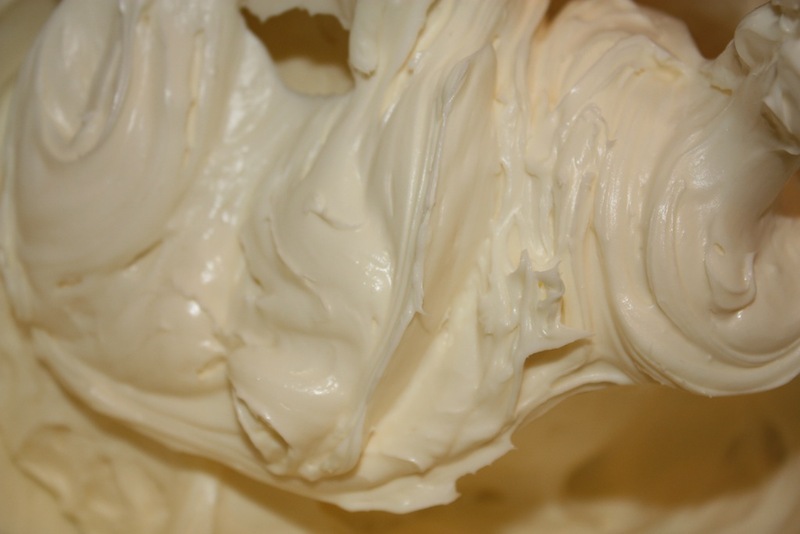 Mix the cream cheese and sugar on medium high speed until light and fluffy, scraping down the bowl periodically, about 3 minutes. With the mixer running on low speed, add the eggs one at a time. 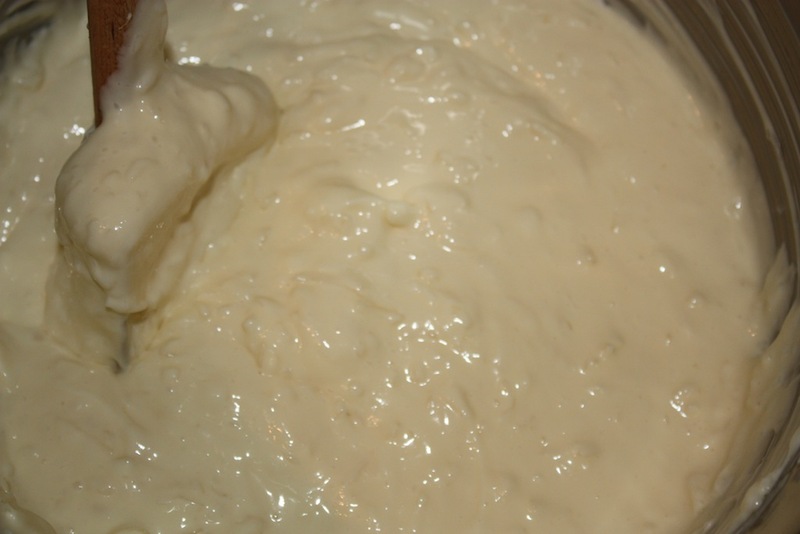 Scrape the bowl down and add the vanilla and sour cream. Lastly, add the coconut. 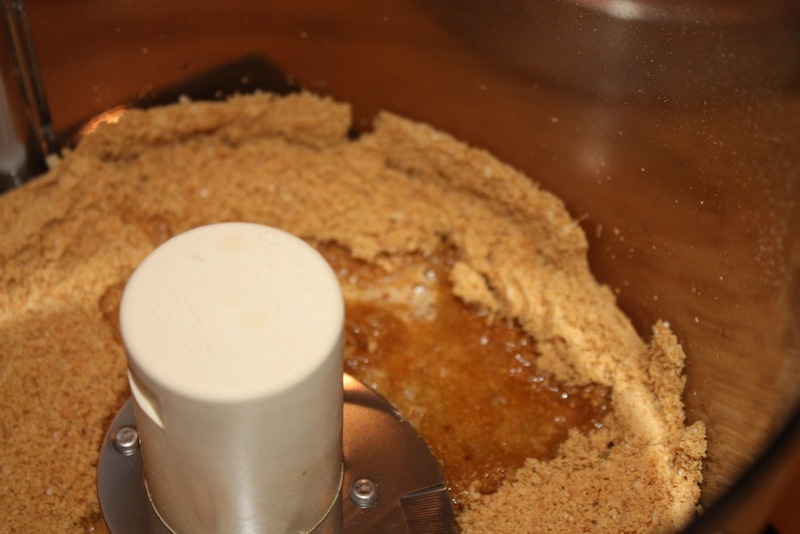 Grease the cake pan (I use PAM®). 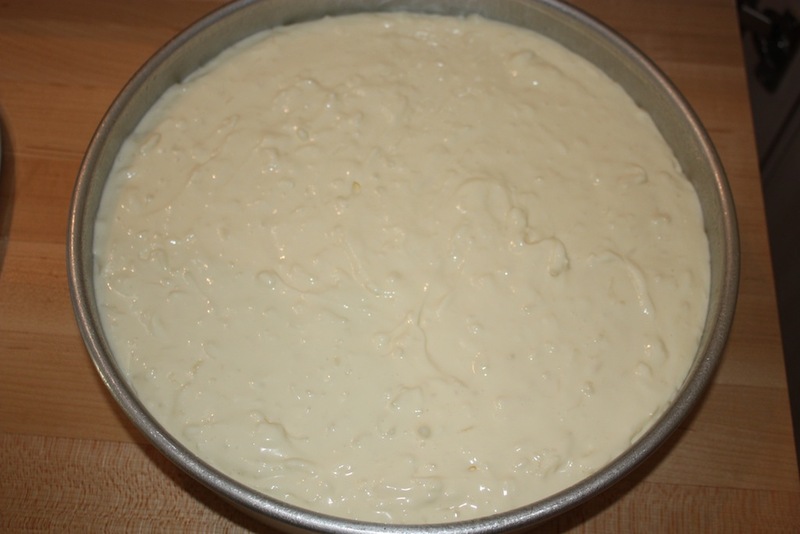 Pour the crust into the pan and spread evenly on the bottom and up roughly ½ ” of the sides. Pour the cheesecake in and smooth the top. Bake at 325° for 50 minutes. 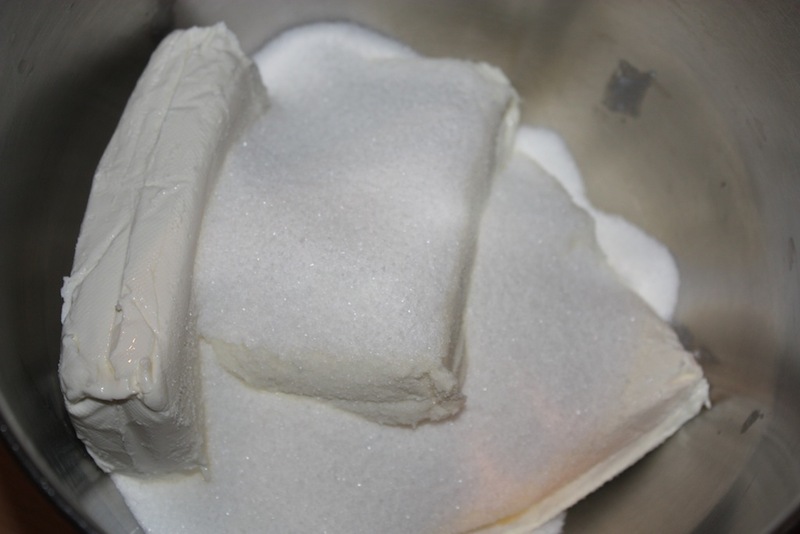 Cool completely and then refrigerate for several hours or overnight. 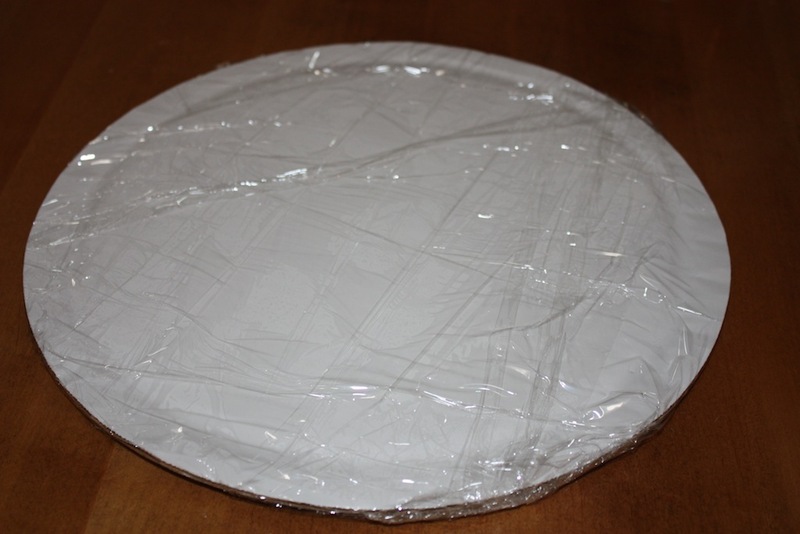 Wrap a 12” cardboard round with plastic wrap and set aside. Place the cheesecake pan in a baking or roasting pan that is large enough to fit the cheesecake pan in (this may also be done in the kitchen sink.) 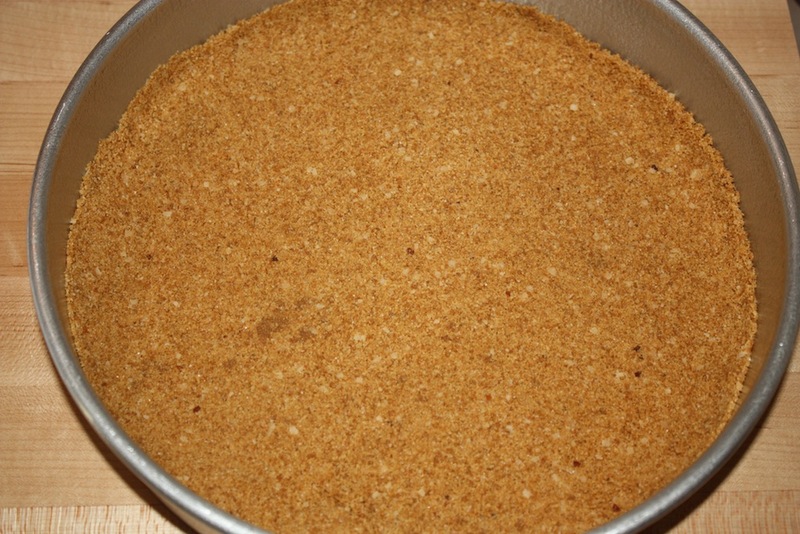 Add very warm water to the larger pan filling it halfway up the sides of the cheesecake pan. Let sit for 20 to 30 seconds. 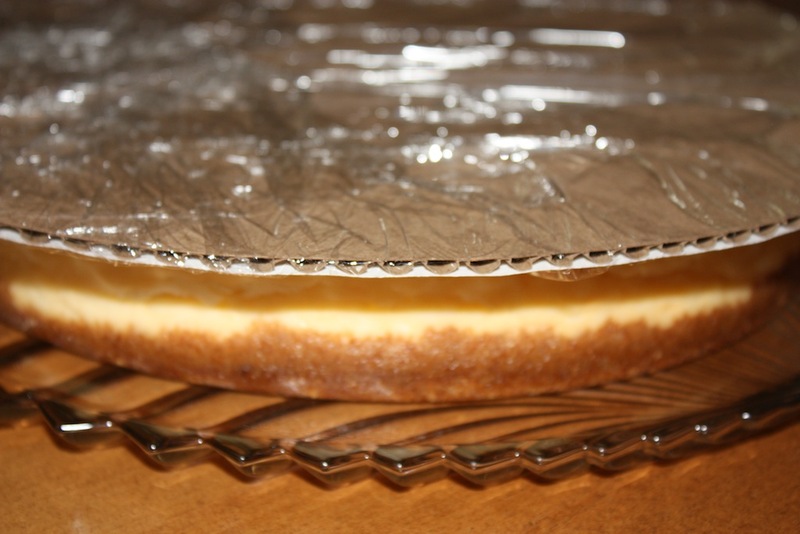 Transfer the cheesecake pan to a dishtowel and dry off the water. Immediately place the wrapped 12” cardboard round on the top of the cheesecake pan. Invert the cheesecake and, holding the cardboard round and the cheesecake pan tightly, firmly rap the cheesecake (upside down) onto a countertop. Carefully lift the cheesecake pan off of the cheesecake. Place the serving plate onto the crust of the cheesecake and turn the cheesecake over, holding onto the cardboard round as you do this. Remove the cardboard round. 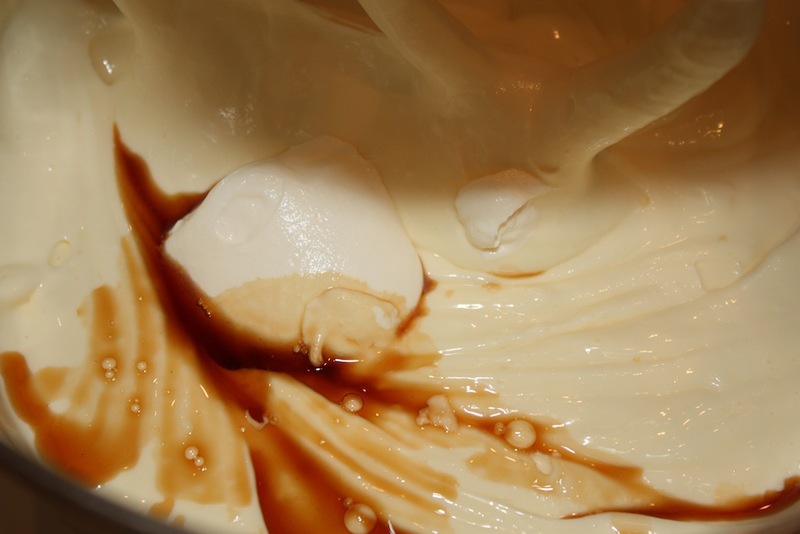 Melt the butter, whipping cream and corn syrup until it simmers. Turn the stove off and add the chocolate, stirring until completely melted. Let stand for 5 minutes. 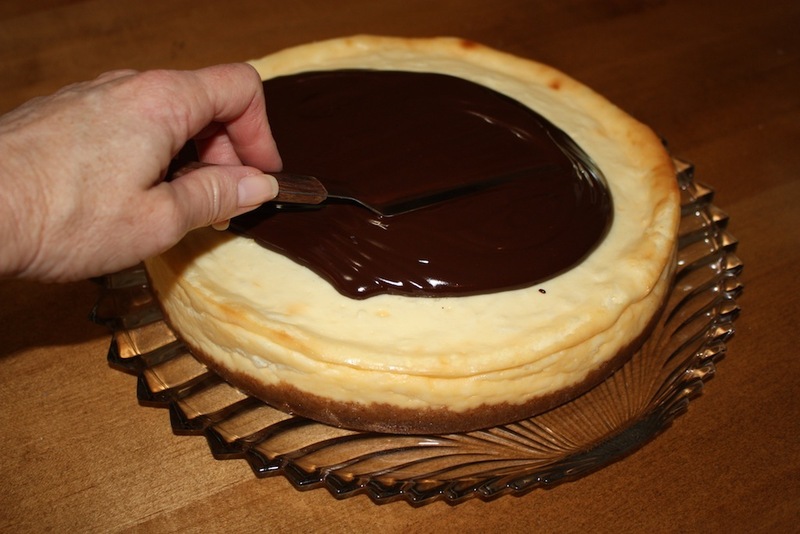 Pour the chocolate over the top of the cheesecake and, using a small metal spatula, spread the chocolate over the top of the cheesecake. 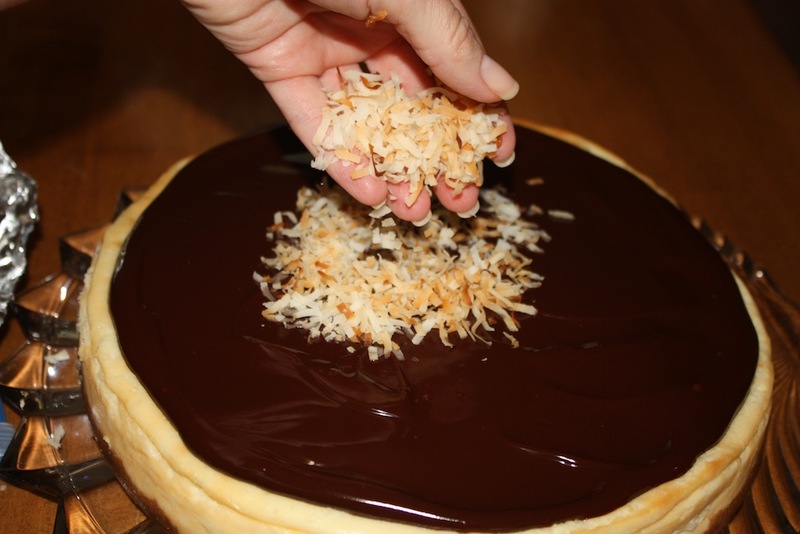 Top the chocolate with the 1½ cups toasted coconut. 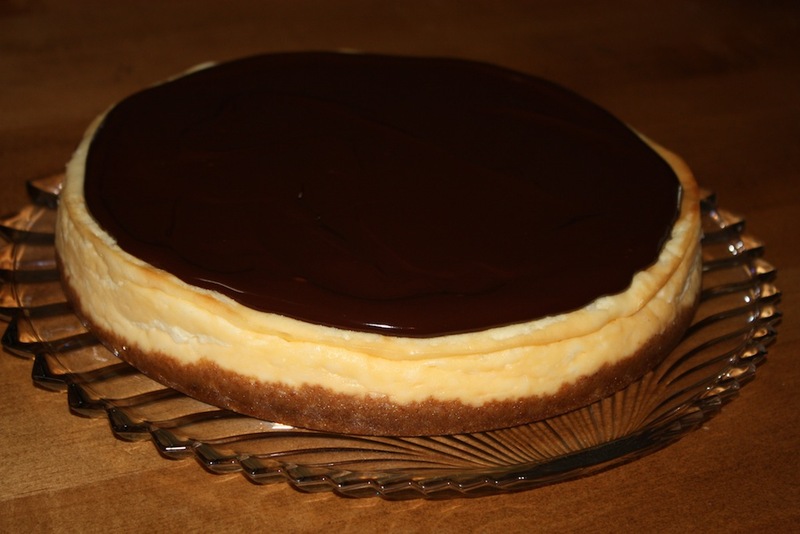 This cheesecake may also be prepared in a springform pan. 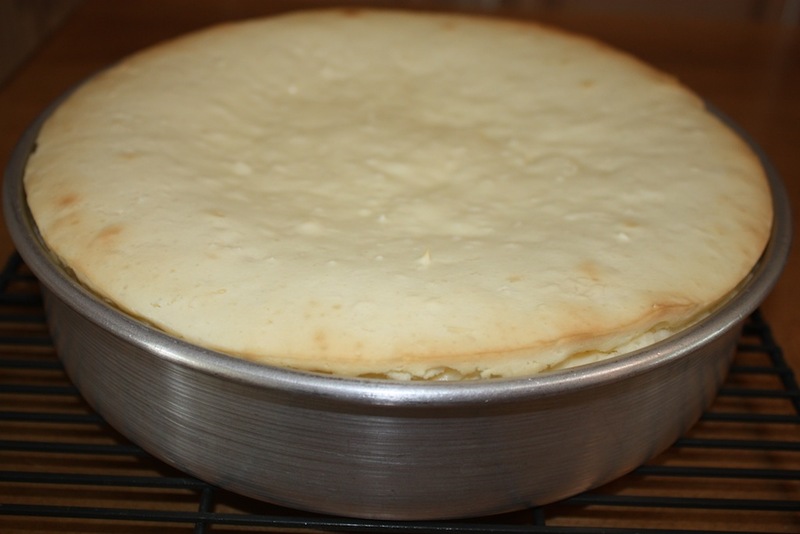 Once the cake cools, remove the sides of the pan and refrigerate until the cheesecake is firm before topping. 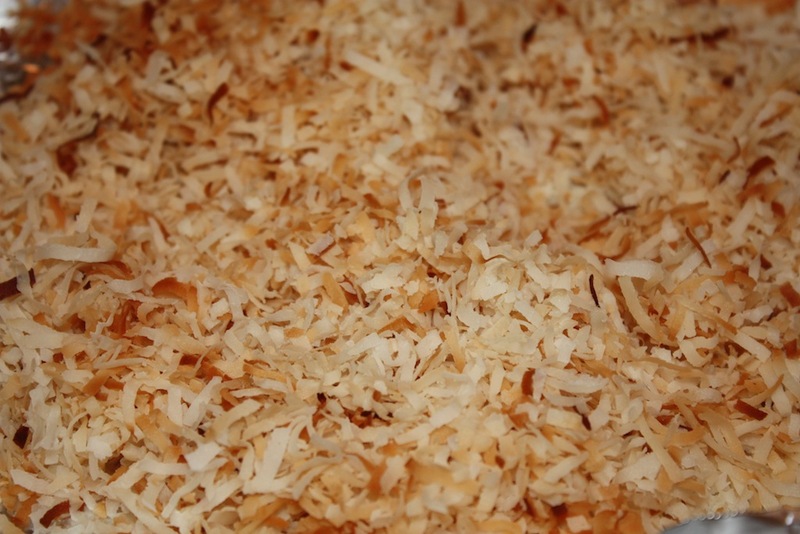 When toasting coconut, do not walk away from the oven as it can burn very quickly. Bake in 300° oven. 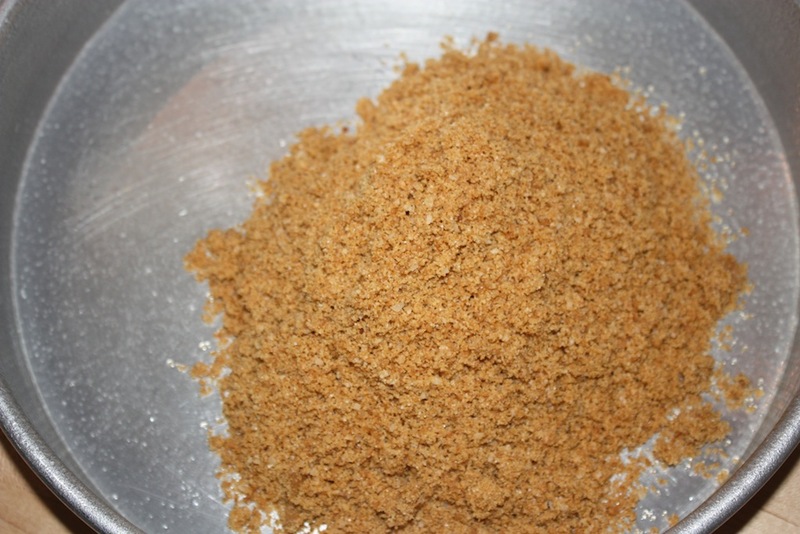 Stir often until the desired golden-brown color is reached. 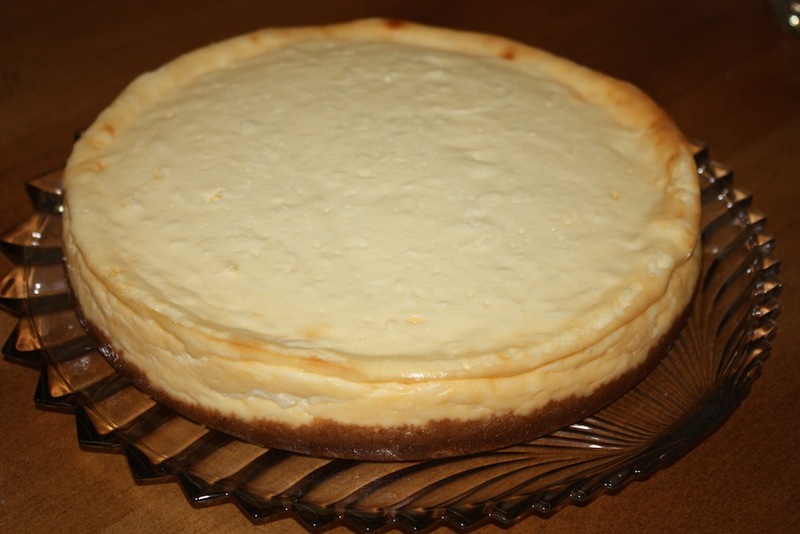 Allow the cheesecake to sit outside the fridge for 20 - 25 minutes before slicing. This will allow the chocolate topping to warm up a bit. Otherwise, the chocolate will be too firm. Since I don’t seem to have as many hands as you have, could this cake be made in a Springform Cake Pan and make my life a little easier when it comes time to take it out of the pan? Also, I was wondering if the kind of pan I buy for either this or for the Banana Bread makes a difference. Do they have to be one of the more expensive pans? Thanks M. Miller for your comment. 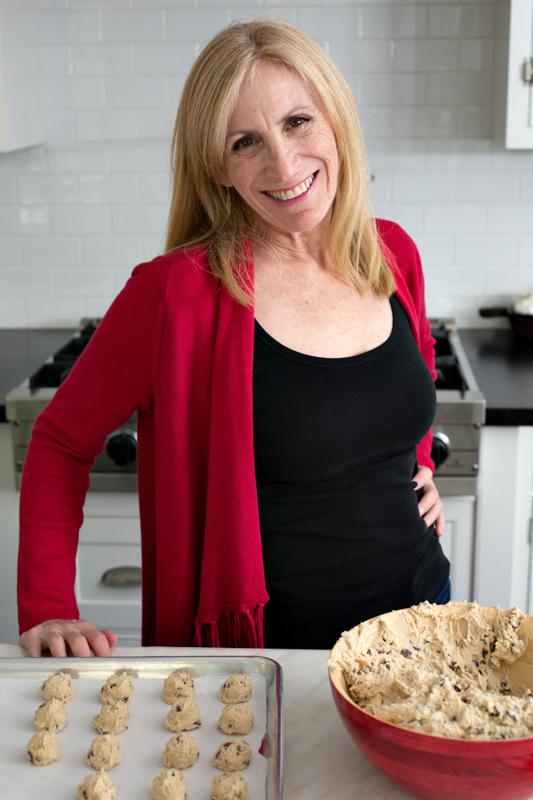 At the bottom of each recipe, I have a section called Betsy’s Tidbits, that lists helpful tips for each recipe. 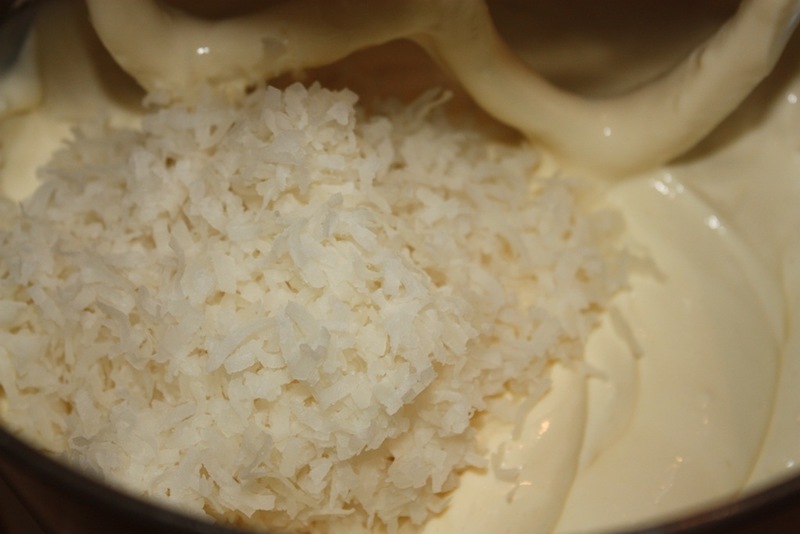 In the Coconut Cheesecake, I mention that a traditional springform pan may be used. In terms of which pan to buy, that is often a personal preference. For springform pans, I like the Kaiser pans. 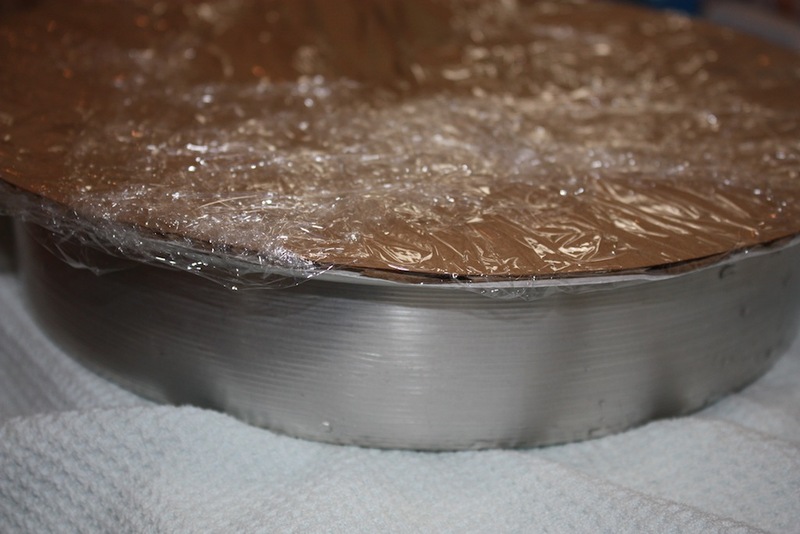 For loaf pans, I prefer those that have a coating to them and I tend to avoid black pans. 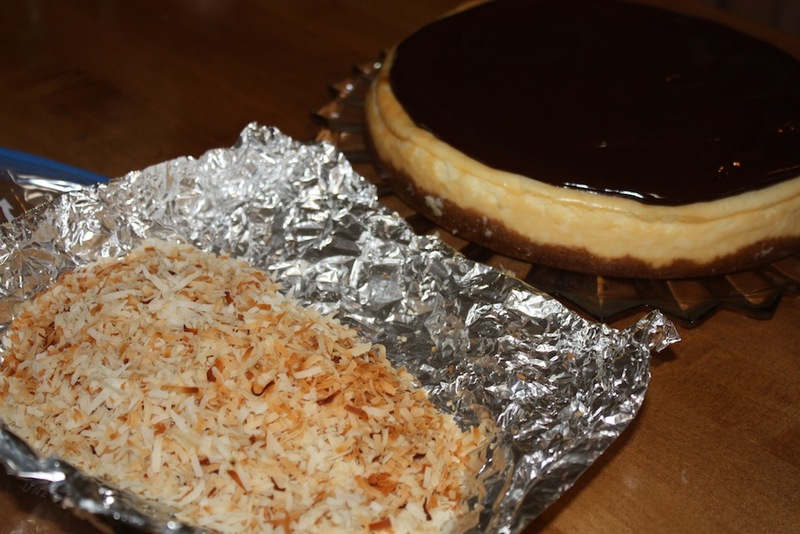 Hope this helps and that you enjoy baking both the Coconut Cheesecake and the Banana Bread with Pecans. Oops, missed the, “Tidbits.” Just one more credit to the wonderful site. Many thanks. I am so glad you found Desserts Required! Thank you for your feedback and please spread the word! This was truly special. 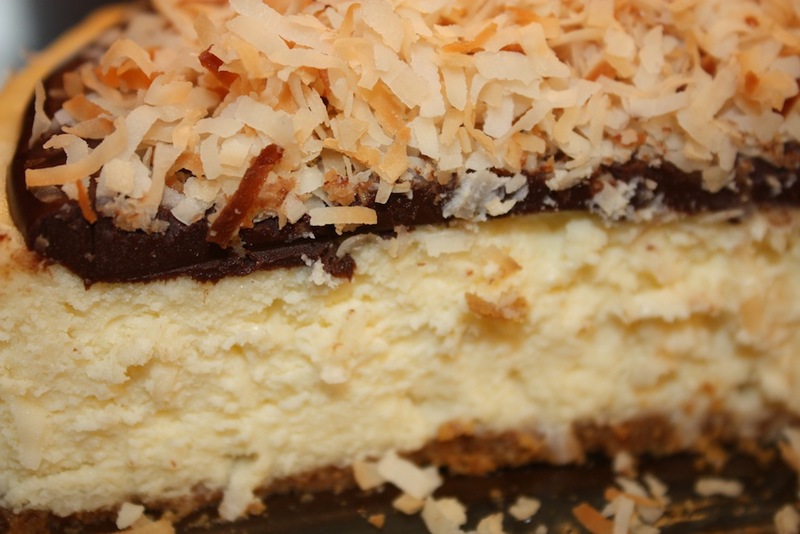 The crunchiness of the toasted coconut combined with the creamy cheesecake filling makes for one delicious and unique combination. I treasure your explicit instructions; as somewhat of a novice, I am never certain of how long something should be mixed or what consistency is considered the right consistency. Your instructions and pictures clarify all. Of course, as a beginner it goes without saying that I can be expected to mess something up. I’m hoping you can tell me what I might have done wrong with the chocolate topping. It was perfect, as I poured it onto the cake. It looked divine and of course, the coconut was the perfect finishing touch. That said, it was very hard, when I sliced it and wanted to slide off the top of the cake. I suspect I put too much on, because the layer was about 1/4 inch thick. Was it supposed to be? It was more like cutting into a Ghirardelli Chocolate Bar of which I could find worse fates in life except for the fact that I was trying to cut into a cheesecake. I want to make it again and hope you can figure out what I might have done wrong. Many thanks for another special recipe to add to my growing repertoire. I am so glad that you are expanding your baking repertoire. Thank you for asking about the chocolate. I realized that I did not originally put a comment in the recipe explaining that one should take the cheesecake out of the refrigerator for 20-25 minutes before slicing. This will allow the chocolate topping to warm up a bit. I have since added this information to the recipe. Oh, I’m so glad I didn’t do anything wrong. Will, definitely, do just that next time I serve it. Thanks.